As with all of the James Bond films, as well as the actors who filled the tuxedo and fancy shoes, there were those that were loved by fans and those that were panned. And that goes for the title themes as well. While Maurice Binder’s almost psychedelic sequences are works of art in their own right, the songs were not always music to the ears. They either suffered from sounding too melodramatic and over the top, often too much like the musical styles of the time. They sometimes didn’t seem to fit in with the style that 007 bled. This song also does not incorporate the title of the movie into the theme song. By no means did the former White Stripes lead singer and uber-talented R&B songstress Alicia Keys butcher this song for Daniel Craig’s second go around as Bond. Even with 007 up to date in the 21st Century, “Another Way To Die” just sounded too rough and (as most critics focused on) did not fit in with the James Bond fashion. Billboard Hot 100 peak position: Number 81 (it reached number nine on the U.K. singles chart). Known for the classic ‘80s hit “Take On Me,” A-ha sang the opening for Timothy Dalton’s first film as James Bond. Producers were pleased with the commercial success of Duran Duran’s theme for A View To A Kill and thought A-ha could achieve the same success. 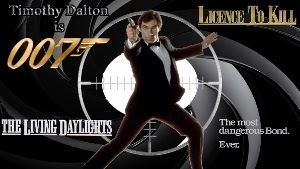 While it remains a favorite amongst some Bond fans, it doesn’t hold up to “A View To A Kill.” However, it remains one of the group’s most played songs in live concerts and has often been extended into a sing-along with the audience. Billboard Hot 100 peak position: Did not chart (it charted in the U.K. where it peaked at number five, it reached number one in Norway.). While I did like this James Bond adventure (the movie’s release came at the time when Star Wars really set forth new films and TV series taking place in the cosmos), the song was CHEESY, in a film that some critics said was either cheesy or campy (even I admit that there was some in this film to a degree). Bassey, who sang the themes for Goldfinger and Diamonds Are Forever, just sounds a little bit overly dramatic warbling this tune. Billboard Hot 100 peak position: Did not chart. Keeping up with the trends of the ‘70s, Moonraker‘s ending title closes with a disco version of the song. 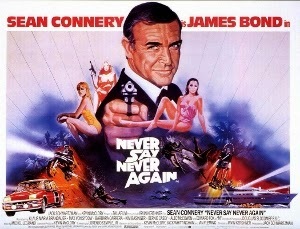 Never Say Never Again is a James Bond film not considered to be a part of the 007 franchise. It is based on the original Ian Fleming novel Thunderball. It was not produced by Eon Productions (“Cubby” Broccoli and Harry Saltzman’s production company that produced the Bond franchise), but by an independent production company, one of whose members was screenwriter Kevin McClory, one of the original writers of the Thunderball storyline with Ian Fleming and Jack Whittingham (he was a close friend of Ian Fleming). McClory retained the filming rights of the novel following a long legal battle dating from the 1960s. This was Sean Connery’s last adventure as the MI6 operative and character that made him a legend. The title theme (and title sequence): it plays like the opening to an ‘80s nighttime soap opera and sounds like the theme to an ‘80s night time soap opera. Singer Bonnie Tyler was offered it originally, but passed on it.